Kinesio Tex Classic Traditional Kinesio Tex Tape with Original Wave. Kinesio continues to provide our famous wave design that has set the standard for Kinesio Taping practitioners worldwide. From elite athletes and weekend warriors to neurological and pediatric patients, Kinesio Tex Classic provides users with high quality and consistent results. Hypoallergenic and latex free for all patient populations. Utilizes a high grade cotton for breathability and comfort. 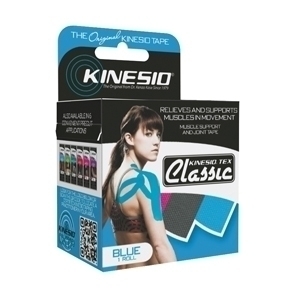 Provides entry level pricing point which enables all to use authentic Kinesio Tex. Available to both medical care professionals and patients.